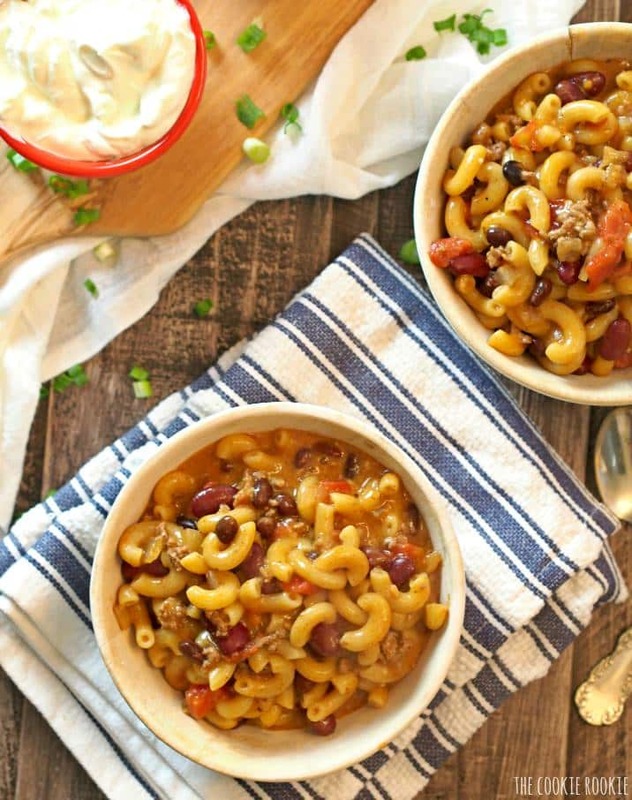 Delicious and hearty Loaded Chili Macaroni and Cheese is the perfect comfort food. 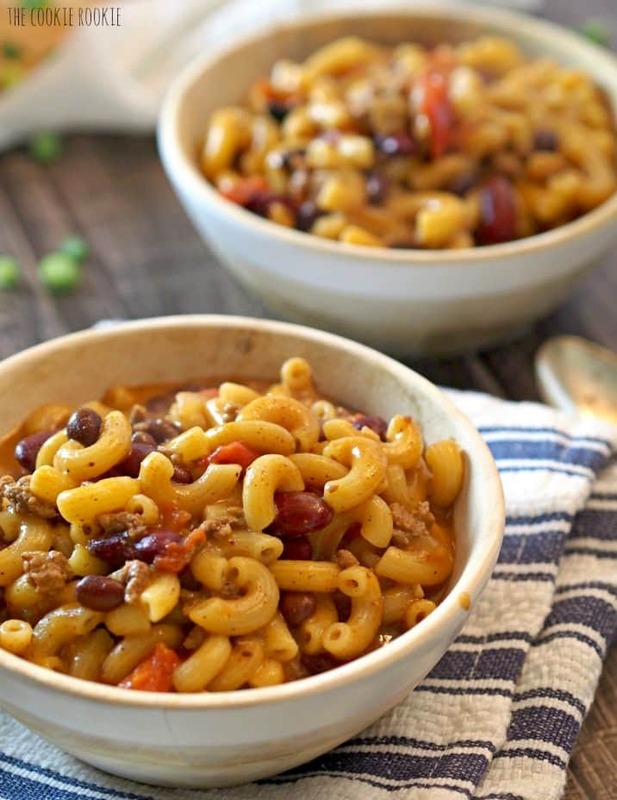 I’ll never get tired of a great mac and cheese recipe! You guys. The Royals didn’t win the World Series. Their magical run was cut short by 90 feet. Game 7. Bottom of the 9th. Heartbreak. I don’t have the writing skills to express all my thoughts…but I do know it was the most exciting sports month of my life. This team on this crazy run made an entire city come alive. The last time the Royals made the post season I was three. A little older than my sweet niece. Our generation has waited a lifetime for another Blue October. Now that it’s over…please pass me ALL of the comfort food. The pain of losing in the 9th of Game 7 is real. When I read recap articles yesterday, I had actual tears. More than once. Silly, yes. Not really very important?? True. But its the memories that get me emotional. That was fun. Okay seriously though, pass me the comfort food. 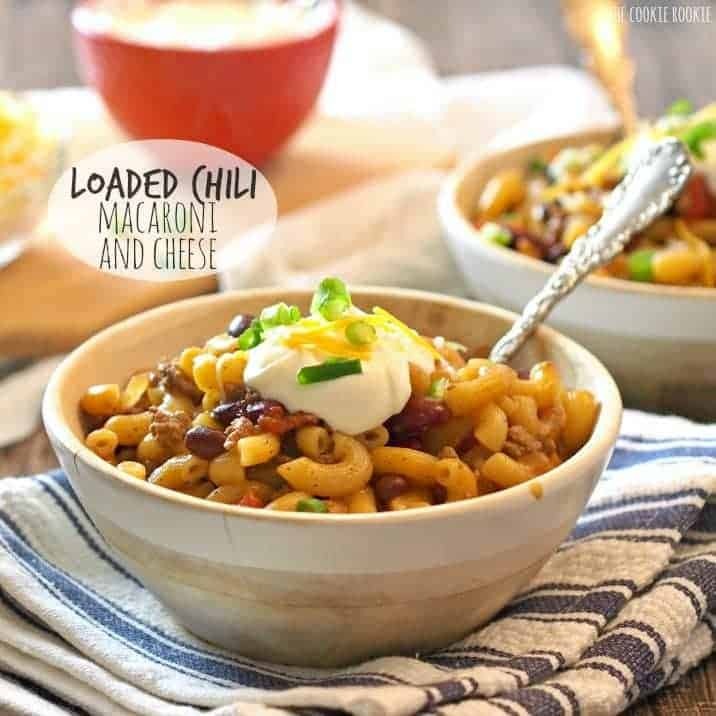 I’m pretty sure that there is no better comfort food than Loaded Chili Macaroni and Cheese. Add some chili and load it sky high with all the fixins and I might just be able to recover from Game 7. Maybe. Not likely but maybe. I needed this recipe to be easy. I have stayed up late many nights this month watching baseball. I’m exhausted. 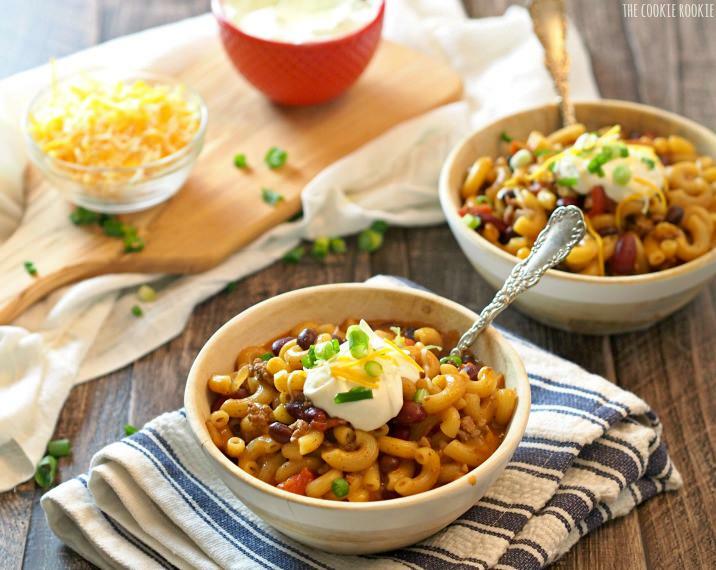 This delicious Loaded Chili Macaroni and Cheese recipe is VERY simple. It’s so good. So comforting. You know what? I think I’ll be okay. I’ve suffered through so many Mizzou losses that the Royals losing the last game of the greatest season in my memory…it’s okay. Its amazing actually. They gave my family memories that we will have forever and someday tell our kids about. 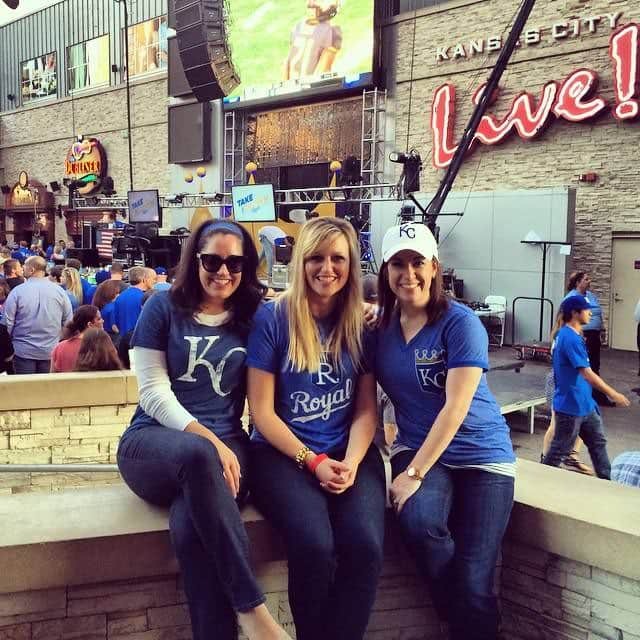 Remember that time Hosmer invited fans out on the town and paid for a $15,000 bar tab?? 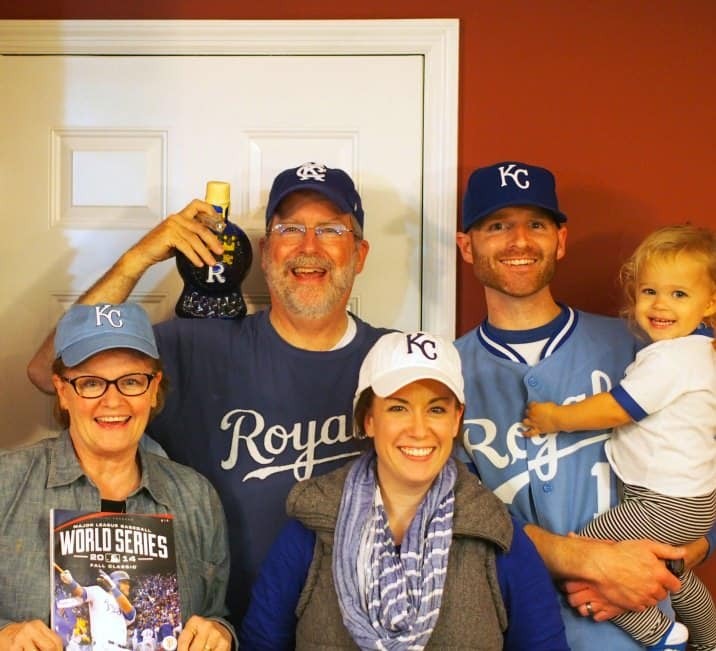 When a Royals fan from Korea became the unlikely good luck charm of a city? Remember when Salvy won the wild card game and we all went crazy? Remember when Billy Butler STOLE SECOND, and Moose caught a ball while diving upside down into the dugout seats? Remember when Gordon almost, almost had an inside the park homerun to tie Game 7? That was crazy. That was awesome. Thanks for the incredible season Royals. I saw my dad dance like a fool and my mom wave a rally towel relentlessly in the living room. I saw my brother try every weird superstitious trick in the book to pull off a win. I watched my Cardinal’s loving husband actually wear blue and cheer for the good guys. And my niece learned some great new cheers. But still, can you pass me that comfort food? 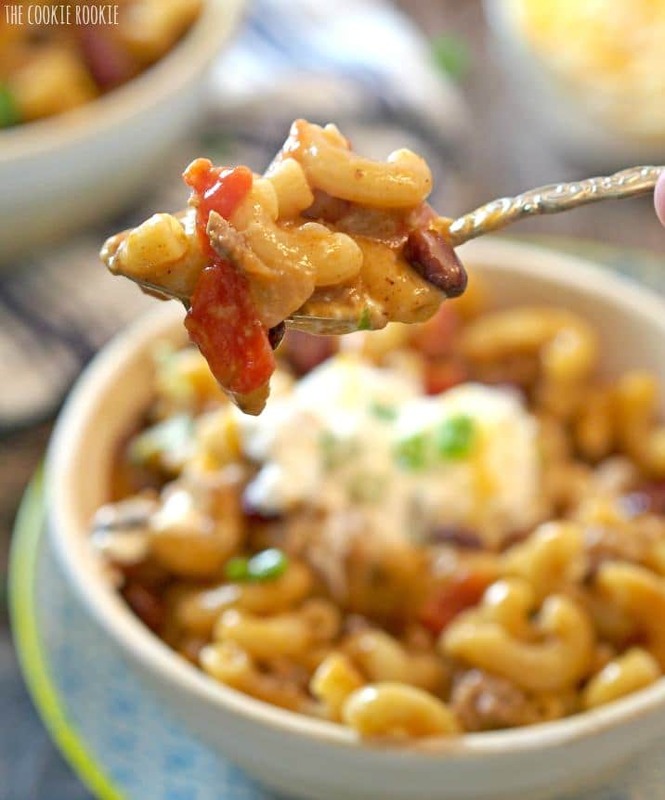 Comfort food doesn't get easier than this one-pot magic meal! My family loves this recipe. Heat garlic, onion and ground beef in a large skillet. You don't need to add any oil, the meat will have some natural oils of its own. Cook until the meat is browned, about 3-5 minutes, crumbling as you cook. Once beef is cooked, drain the excess oil. Add beef mixture, chicken broth, tomatoes, beans, chili powder and brown sugar to a pot and season with salt and pepper, to taste. 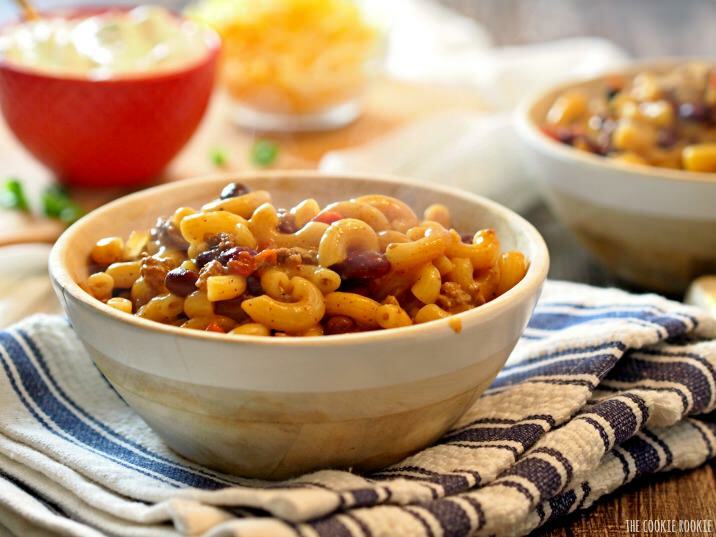 Bring to a simmer and stir in pasta. Bring to a boil; cover, reduce heat and simmer until pasta is cooked through. It should take about 13-15 minutes for the pasta to fully cook. Remove from heat. Stir in cheese and stir until well combined. The cheese should melt into the mixture. 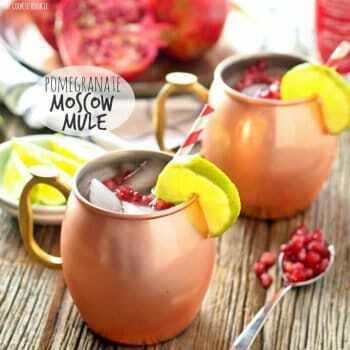 Serve immediately, garnished with sour cream and green onion. Enjoy! I know Jessica! Even living in STL now, it felt so sad!! Thanks for stopping by, it was so fun to meet you! 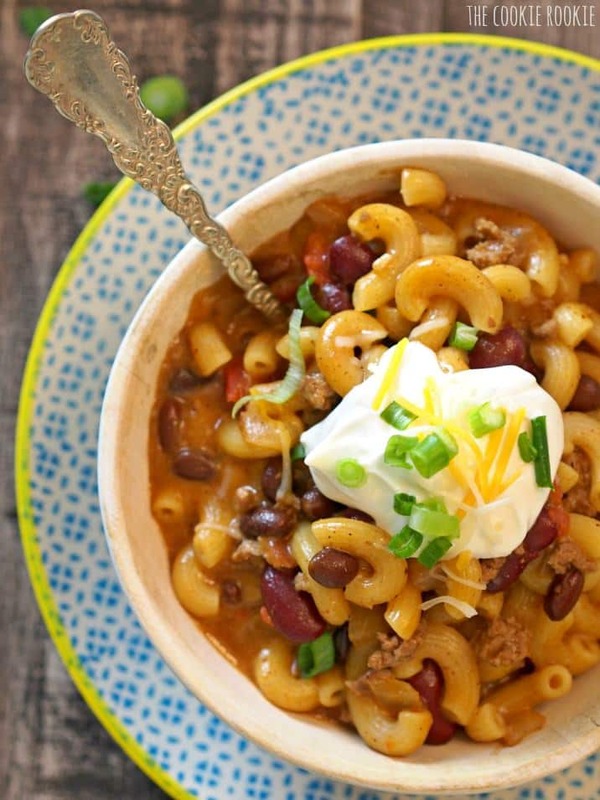 This really does look like the perfect comfort food! Sorry for your loss, I’m a Mets fan, so I definitely feel your pain! You know what I’m talking about then Sonali!! I love your site and your instagram, you always post the prettiest things! Thanks for stopping by! We were rooting for the Royals, too. :( But it was an exciting series!! And this is definitely my idea of comfort food. YUM!! It was so exciting!! Hard to be upset after such a fun month. Thanks for stopping by Deborah! This mac and cheese looks SO delicious.. wish I had a bowlful to devour right now. Great pics too! Thanks Thalia! Means a lot coming from you! I miss Missouri. But your wonderful recollections of World Series 2014, my favourite sport and a delicious mac & cheese recipe make this homesick Londoner feel slightly less than half a world away for one precious day. Thank you. I live near KC and yes, it was a crazy, wild ride!! Anyway….how would you convert this for a slow cooker (if it could be)? 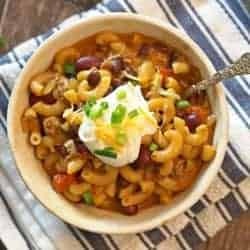 I was looking for the perfect chili mac recipe and after scourging through countless recipes I came across this one. It had all the elements I was looking for. 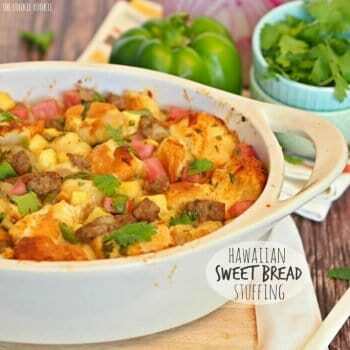 After my wife and kids and I all say and thoroughly enjoyed this dish everyone went back to their activities fat, happy, and full! 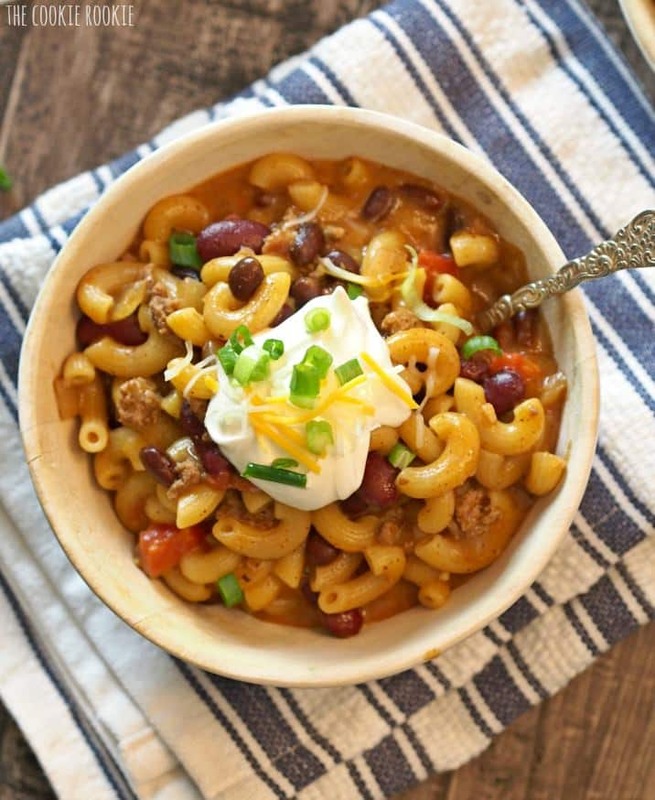 I will be revisiting this recipe again on a cool, rainy Saturday for a family gathering to watch our Home Team the Texas Longhorns!! HOOK ‘Em!!! I’m SO glad to hear this…totally made my day!! Thank you so much for saying hi!